You know when you’re really nervous before the performance and you kinda forget the choreography? I mean when your body knows it—I don’t know, it’s like you just stop thinking. Time stops. When you’re just flowing. The 2015 film The Fits is about movement and corporeality, about social belonging, about yearning to be absorbed into a girl group. It’s about finding oneself in movement with others. It’s also about sickness as a kind of art. The source of the “fits” the girls are manifesting is not the water. It’s not a “boyfriend disease.” It’s art, and you get it from your friends. 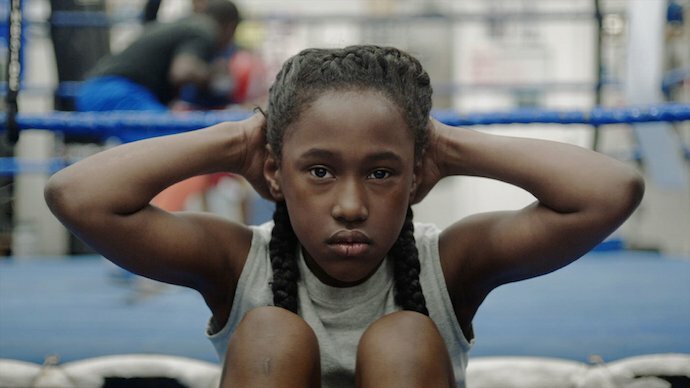 The film opens in a boxing gym, where 9-year-old tomboy Toni (Royalty Hightower) is the only girl training. Toni is first introduced to the viewer while training, subjecting her body to repeated motions: crunches, punches, jumping jacks; running up and down steps. When her curiosity is piqued by the dances who practice upstairs, she starts lurking around their gym and eventually tries out for the team. For the film’s first half, Toni moves between the masculinized world of boxing and the all-girl drill team she seeks to join, a liminal state represented by the caged bridge she runs up and down while training. Eventually her jumping jacks conjure the sound of the dance team stepping and clapping, and she interrupts her workout to practice her choreography. At last, she’s crossed over. She’s committed—not just to the form, but to the girl culture attached to it, conveyed later, when Toni pierces her ears in the locker room. Then one of the team captains seizes during practice. The team is shaken. Soon the other captain has the fits, then another girl, and another. In some ways reimagining the recent case of collective hysteria in Le Roy, NY, the film doesn’t purport to know where the fits come from, but suggests they may be performed for, and through, the group. The girls aren’t faking it; they’re “getting” it. Like you get choreography. Like you get social cues. The fits jolt the body, rerouting its circuits with new possibilities, new moves. Oh I got moves. At one point two girls are challenging one another to a stand battle (a dance battle). Their moves are inspired, magnificent, until—even as—one of them breaks into the fits. For a moment, it’s unclear whether the seizure is part of her routine. The character’s movements are jawdropping, breathtaking, impossible to replicate. A fit of genius. Then, abruptly, she’s sick. Soon the illness becomes desired, desirable. It’s communicable, transmissible. It’s art. I just want to know how it feels, says Toni’s friend Maya softly, standing in the bottom of the school’s empty swimming pool, staring at the sky as if entranced. Soon, Maya gets it. She has a fit. Each fit presents as an individual masterwork, a peculiar solo that can only be achieved via access to the group’s energy. If we view these girls’ fits as a form of duende, then, we must view duende as a force channeled both communally and individually. When Toni achieves her own fit, the final fit of the film, it’s because she has finally invited the collective energy in. It’s a miraculous moment, a debut, a declaration of presence, what the film seems designed to reach. With her whole team as witness—their expressions ranging from horror and revulsion to admiration and awe—Toni submits to her body’s energies—and becomes entirely herself. It’s a spectacle. It’s disturbing, it’s sick, it’s triumphant. She floats.